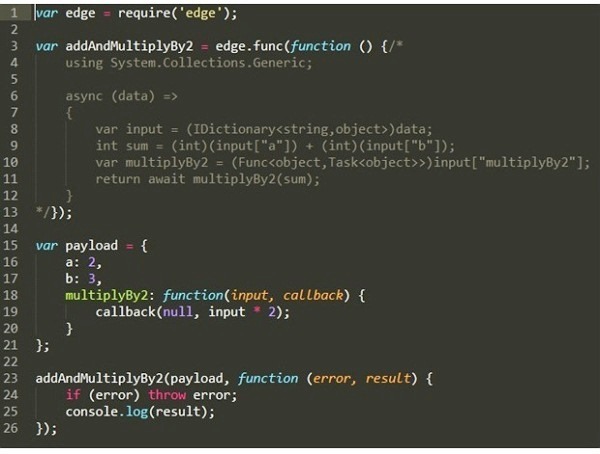 The Edge.js project enables you to run Node.js and .NET code in one process. In this article I discuss the motivation behind the project, describe the basic mechanisms Edge.js provides, and explore a few scenarios where it can help you develop your Node.js application. While many applications can be written exclusively in Node.js, there are situations that require or benefit from a combination of Node.js and .NET. You may want to use .NET and Node.js in your application for several reasons. .NET framework and NuGet packages provide a rich ecosystem of functionality that complements that of Node.js and NPM modules. You may have pre-existing .NET components you want to reuse in a Node.js application. You may want to use multi-threaded CLR to run CPU-bound computations that are not well suited for single-threaded Node.js. Or you may prefer to use .NET Framework and C# as opposed to writing native Node.js extensions in C/C++ to access mechanisms specific to the operating system not already exposed through Node.js. 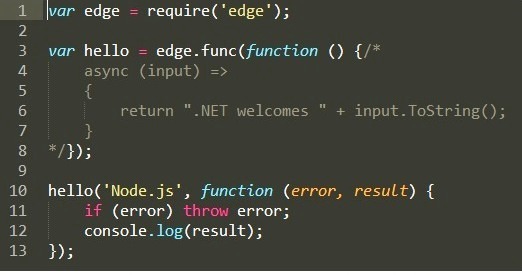 There are two main benefits of using Edge.js to run Node.js and .NET in one process instead of splitting the application into two processes: better performance, and reduced complexity. Performance measurements of one scenario show that in-process Edge.js call from Node.js to C# is 32 times faster than the same call made using HTTP between two local processes. Dealing with a single process instead of two processes with a communication channel between them reduces the deployment and maintenance complexity you need to handle. The first line imports the edge module previously installed from NPM. Edge.js is a native Node.js module. What is special about Edge.js is that the moment it is loaded it starts hosting CLR inside the node.exe process. The interop pattern does not prevent you from accessing any parts of .NET framework, but it will often require you to write an extra adapter layer to expose the desired .NET functionality as a Func<object,Task<object>> delegate. 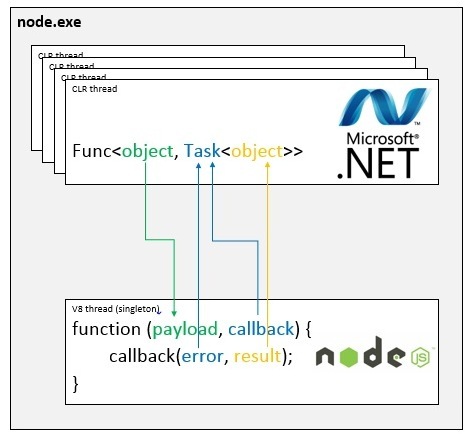 This adapter layer requires that you explicitly address the issue of blocking APIs in .NET by possibly running the operation on a CLR thread pool to avoid blocking the Node.js event loop. The ability to marshal functions between V8 and CLR combined with the concept of a closure is a very powerful mechanism. It enables .NET code to expose functionality of CLR objects to Node.js. The local variable in line 3 in the last example could as well be an instance of a Person class. Let’s have a look at a few practical examples of how you can use Edge.js in a Node.js application. The implementation in sql.csx file uses asynchronous ADO.NET APIs to access MS SQL and execute T-SQL command provided to it from Node.js. The two examples above represent just a small portion of scenarios where Edge.js helps you write Node.js applications. You can see more samples at the Edge.js GitHub site. Edge.js is an open source project licensed under Apache 2.0. It is currently under active development and contributions are welcome. You can check the list of work items that could use your time and expertise. Although all the examples in this article were using C#, Edge.js supports running code in any CLR language within a Node.js application. Current extensions provide support for scripting F#, Python, and PowerShell. The language extensibility model allows you to easily add compilers for other CLR languages. Edge.js currently requires .NET Framework and therefore only works on Windows. However, support for Mono is under active development and will enable running Edge.js application on MacOS and *nix in addition to Windows. Tomasz Janczuk is a software engineer at Microsoft. His current focus is node.js and Windows Azure. Before that he worked on .NET Framework and web services. In his free time he engages in a lot of outdoor activities in the Pacific Northwest and beyond. You can follow him on Twitter, @tjanczuk, check out his GitHub page or read his blog for more information. this way I achieve my task, but main problem is c# dll's method is not asynchronous So for that they already using on that project. I written wrapper method which is calling as asynchronous .